This salsa is one of the most evident examples of the Mexican cuisine’s miscegenation, especially when we place ourselves in the state of Veracruz, where the European influences fused with Prehispanic ingredients and techniques. The Veracruz style salsa consists of a tomato salsa that is enriched with a number of ingredients that the Spaniards brought to Mexico; which started to popularize in Mexican dishes. 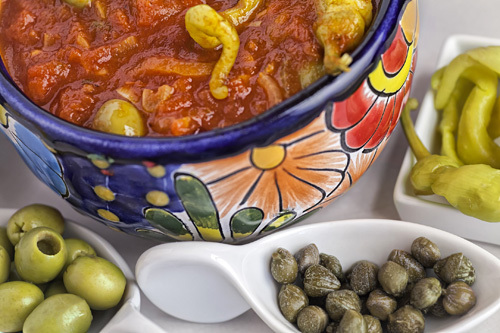 The salsa is prepared with typical Mexican ingredients and the ingredients that are annexed, on behalf of the Spaniards, are the olives, capers, oregano, garlic and oil. It can be said that the salsa is very condimented and in each bite you will find different consistencies and textures . Its flavor is exquisite, its consistency is very thick and as it can be imagined is the salsa that is used in the Veracruz style fish. It can also be used on another type of fish or even on some shrimps. The preparation of this salsa is tedious but it is not complicated. To make the salsa olives are needed and we recommend buying them pitted. Another ingredient that is used in the salsa is the banana pepper. It is very important to use them pickled because they give a very good touch to the salsa. The total preparation time is of 45 minutes but while the salsa cooks (30 minutes) you will almost not work in the recipe. With this recipe you will obtain 4 cups of salsa. Make a shallow X cut on the inferior part of 6 tomatoes (2.6 lbs), then reserve. Pour in a saucepan the enough water to cover the 6 tomatoes with the ones you worked and bring it to a boil over high heat. When it boils incorporate in the saucepan the 6 tomatoes with the ones you worked and leave them cooking in the boiling water for about 25 seconds, until the skins start to separate. Take from the saucepan, with a kitchen spoon, the tomatoes that were cooked and rinse them with cold water. Remove the skins of the tomatoes that were rinsed. Upon completion put them in a blender. Blend very well the tomatoes and reserve. The tomatoes’ skin has to be removed because it is not pleasant to find the skin of a tomato in the dish that was seasoned. Dice 2 tomatoes (14.1 oz), then reserve. Finely chop 2 onions and 6 garlic cloves; then set aside. Heat in the saucepan over low heat 6 tablespoons of olive oil. The Onions that were minced. Mix the saucepan ingredients and fry them for approximately 1½ minutes, until they look a bit transparent; stir regularly. Mix the saucepan ingredients and fry them for 30 seconds, so the oil acquires more flavor; stir regularly. The Tomatoes that were blended. Cover the saucepan and cook the ingredients for about 20 minutes, until they have a thicker consistency and they acquire a more vivid color; stir occasionally. If you want to give an extra point of flavor to the salsa also add 1/2 cup of white wine. Mix the saucepan ingredients and cook the Veracruz style salsa for about 10 minute, until it thickens and acquires a more intense color; stir occasionally. Suggestion: Another jarochan salsa that you will like a lot... the comapeno pepper salsa. These banana peppers will give a precise flavor to your salsa.